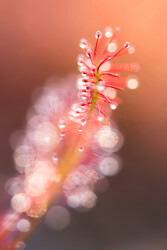 I just can’t believe it has been so long ago (2009) that I took my last Sundew pictures. 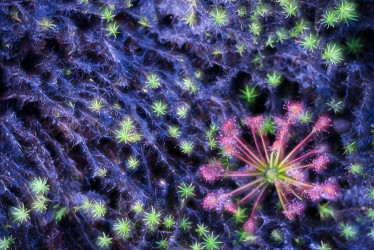 I love this photogenic plant, but somehow along the way it lost my attention. Until last summer when I just accidentally and therefore unexpectedly bumped into it again. I instantly re-fell in love and decided to follow it for a few weeks. 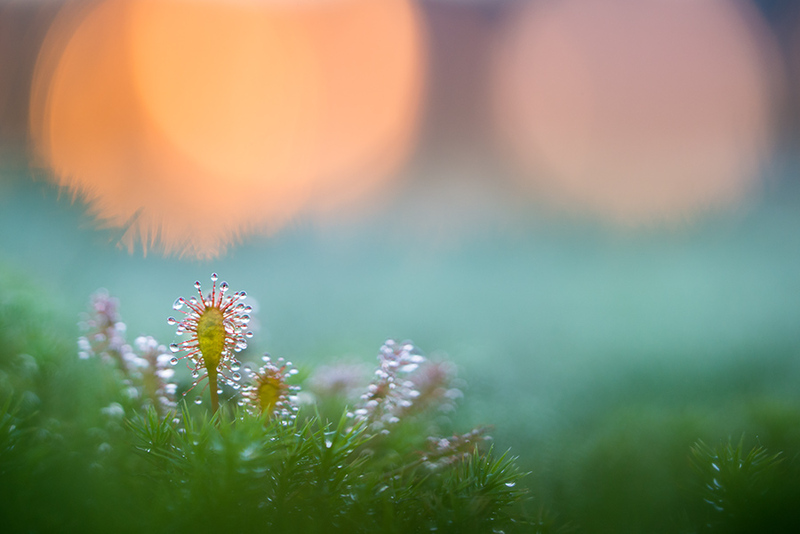 The Sundew is a master seducer. Starting with its leaves. Its leaves look like flowers because of their color and beauty but they are ‘just’ leaves. In fact its real flowers are the less distinctive part of the plant, blooming only for a week or so with little white unobtrusive flowers. Then there are the little droplets at the end of the tentacles that grow on each leave. 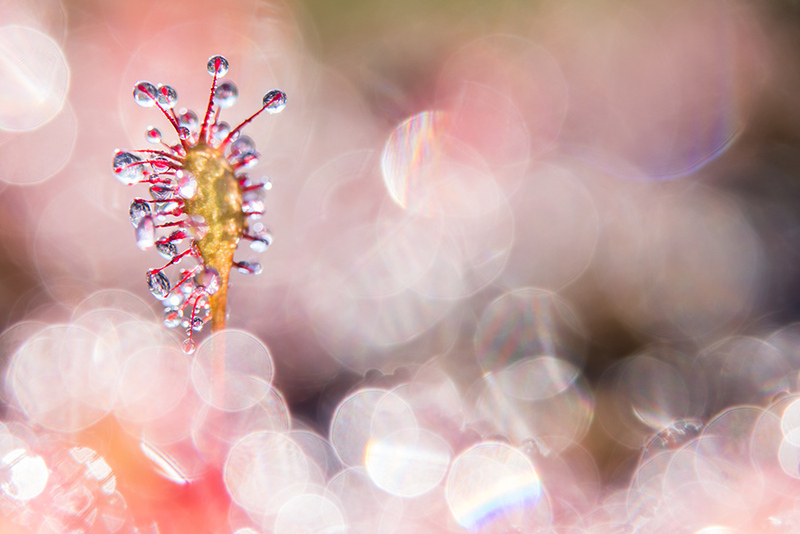 These droplets look like dew, therefore obviously its name. It is not dew however but nectar. This nectar produces a sticky digestive enzyme with which it attracts insects. 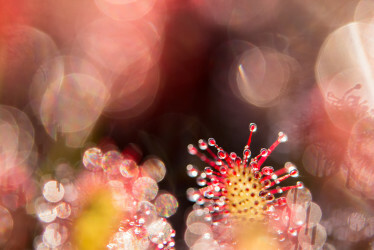 So yes, the Sundew is a carnivorous plant! It can trap and digest insects in order to obtain nutrients such as nitrogen. This allows the plant to survive where others can’t, namely in nutrient and low nitrogen moist areas. When an insect lands on a leaf, it gets stuck on the ‘dew’. As it struggles to get out of it, the tentacles of the leaf start to wrap around the insect. Eventually the insect suffocates and dies. 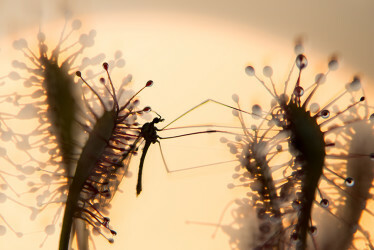 The enzymes of the plant absorb the well needed nutrients of the insect in order to survive. This digestive process will take up to a week or so. After this period the leaf unfurls and it is ready for its next prey. Over here in the Netherlands there are three sorts of Sundew: Drosera intermedia, Drosera rotundifolia, and Drosera anglica. I photographed the first one, Drosera intermedia. Once it was on the red list, but because of good nature management to preserve moist heathland and peaty soil it now luckily is a bit more common.